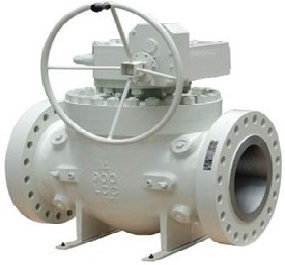 Forged steel trunnion mounted ball valves, 3 piece split body, side entry, gear operated or bare stem with ISO 5211 mounting pad, full bore or reduced bore. 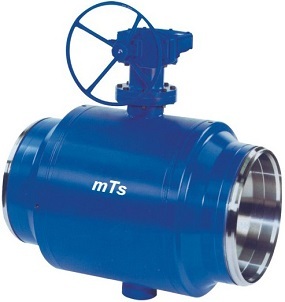 The forged steel trunnion mounted ball valve manufactured by Metals Valve is 3-piece split body and side entry. 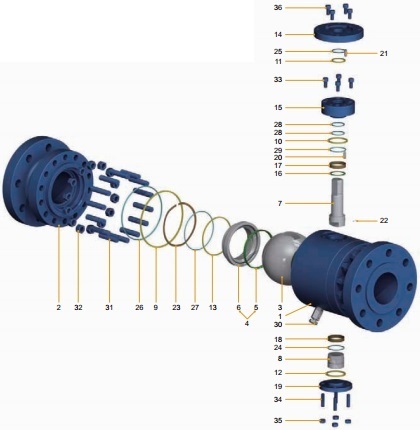 This series of valves are designed conforming to almost the same standards and codes as that of cast steel trunnion mounted ball valves. The 3-piece body refers to left/right closure parts and the mid body which are all made from forgings. Compared to its cast counterpart, the forged steel body and closure parts eliminate the inevitable defects of casting and drastically improve the microstructure as well as mechanical properties. 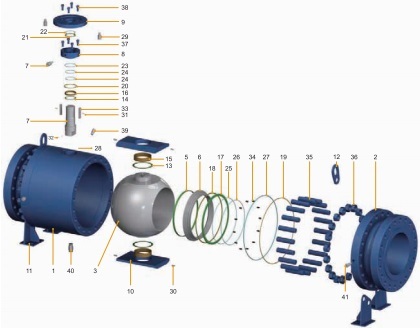 Design standards: API 6D, API 608, BS 5351, ISO 14313, ASME B16.34; Fire safe to API 607, BS 5146, ISO 10497, API 6FA; End connection: ASME B16.5, ASME B16.25, ASME B16.11; Face to face: ASME B16.10; Inspection and test: API 598, API 6D, EN 12266-1. 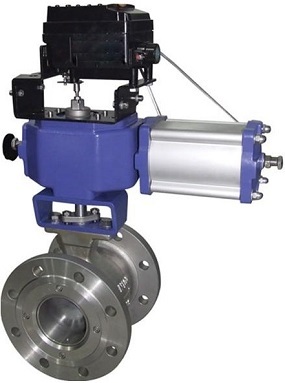 The forged steel trunnion mounted ball valve is available in either full port(FB) or reduced port(RB), 3 piece split body and side entry, lever/gear or actuator operated. Generally, sizes above 4″ are furnished with 4 of supporting legs. Serial No. : FTBV12. See the technical drawing and dimensions of FTBV12. 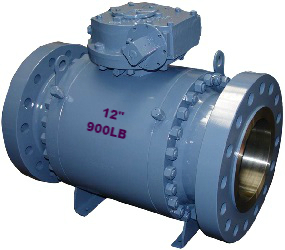 Design features of forged steel 3 piece trunnion mounted ball valve, 4″ and smaller sizes, side entry. (1) Double sealing O-rings to prevent leakage from stem area. (2) T-shaped blow-out proof stem design. (3) Fire safe metal to metal design for emergency seals once soft seating materials are disintegrated after fire. (4) Gasket & O-ring combined arrangement to prevent leakage from body joints. (5) Seat spring to exert force on the seat to ensure a tight sealing even at low line pressure. 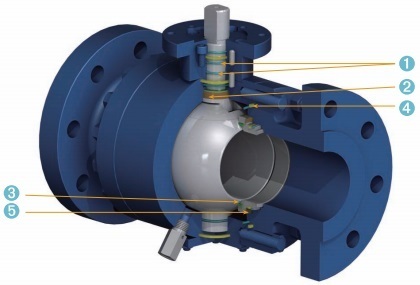 The 3D explosive view of a forged steel 3 piece trunnion mounted ball valve (for 4″ and smaller sizes). The material selection table for forged steel trunnion mounted ball valve, 3 piece split body, side entry, for sizes 4" and smaller. Other materials are available upon request. 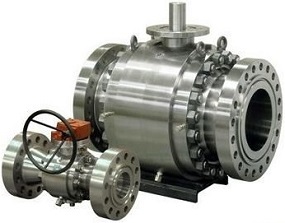 Design features of forged steel 3 piece trunnion mounted ball valve, side entry, for sizes above 4″. (2) & (4) Sealant injection fittings to prevent stem or seat leakage in case the internal sealing fails. (3) T-shaped blow-out proof stem design. (6) Gasket & O-ring combined arrangement to prevent leakage from body joints. (7) Preloaded seat spring to exert force on the seat to ensure a tight sealing even at low line pressure. The 3D explosive view of forged steel 3 piece trunnion mounted ball valve, side entry with supporting legs, for sizes above 4″. 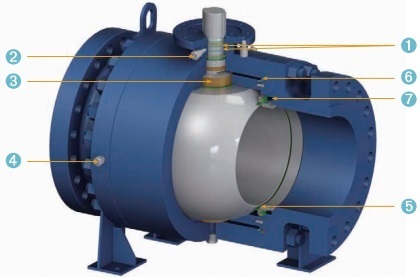 The material selection table for forged steel trunnion mounted ball valve, 3 piece split body, side entry, for sizes above 4" with supporting legs. Other materials are available upon request.